Literacy Council – A great start for every child! Interested in helping us accomplish our state-directed outcome of preparing children to succeed in fourth grade and beyond by reading proficiently by the end of third grade? Our Literacy Council is comprised of Great Start Collaborative members, Spies Public Library staff, and community members who want to help provide opportunities that encourage reading to young children in our community. We also strive to educate parents on how to help their child become passionate about books from a very young age. Visit our Literacy Council Facebook page HERE! Some of the current projects are listed below! Welcome to the public! 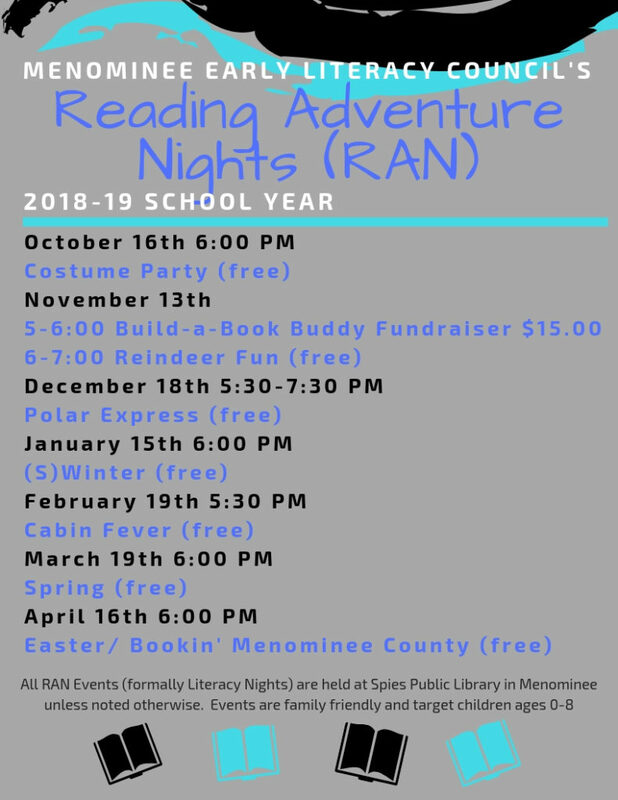 Free family-friendly events comprised of a fun activity, a snack, a story, a craft and socializing! These events are for families with children 8 years old and younger. 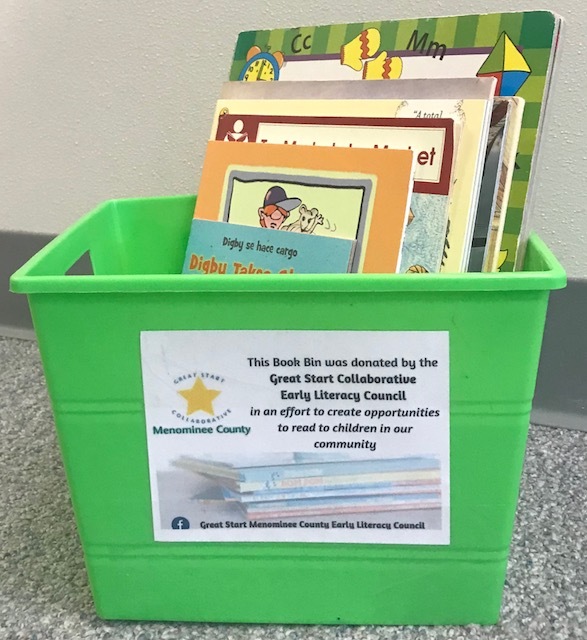 This project involved our literacy council putting together bins filled with new and used books to be distributed throughout Marinette & Menominee Counties in areas that have a waiting area. We hope to encourage reading with your child while you wait! If you are have business that is interested in a free book bin, please contact us at 906.863.5665 ext 1028! COMING SOON! We are excited to announce this project in Spring of 2019!!! Visit our Imagination Library tab to learn all about this wonderful program that sends a free book mailed to each child every month under the age of five! Our Great Start Collaborative, through the Literacy Council, helps fund this program by searching for new grants and fundraisers year-round! Our most current fundraiser is Build-A-Book Buddy!